We all know that vegetables are REALLY REALLY important for our bodies. Unfortunately they are easily the last thing we think about when planning our lunch and dinner. One of the best things (not the only thing, I am not that sad! ), about the Autumn settling in, is that a warm bowl of soup gets the taste buds following more than ever. Soup is cheap, easy and usually packed full of goodness. Making it from scratch is even better than buying it out as you can throw in tons of veg and it usually (I have made a couple of mistakes! ), tastes amazing. 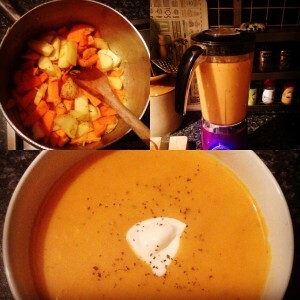 One of my favourites is Sweet Potato soup served with warm, crusty wholemeal bread and salad. This is one of my husband’s favourites and due to the high content of sweet potato, it fills you right up for a long time. Perfect for a hearty dinner as well as a sustainable lunch! 1. Gently heat up coconut oil in pan and add the finely chopped onion and garlic clove. Saute the onion and garlic in the pan. 2. Chop up both the sweet and white potatoes (the smaller you chop them the quicker they cook), and add them to the pan. On a low heat, fry them gently for around 5 mins. 3. Dissolve the vegetable stock cube in the boiling water and add straight to the pan with the potatoes. Season with salt and pepper and allow the potatoes to boil until soft enough to blend. 4. Pour the mixture into a blender and whizz up. 5. Once the mixture is nice and smooth, transfer back to the pan and put on a low heat. Now its time to taste and tweak the soup. Add in the basil and more seasoning if needed. Some people prefer their soup thinner, if that is you, gradually add a bit more boiling water until you get the desired thickness. If you also like your soup to have a little bit of a creaminess like me, add in the milk and serve with a dollop of creme fraiche! Soup is also a great thing to make a big batch of and then divide up for lunches. N.B. This recipe makes roughly x4 large bowls full.